Red Cottage / Farmhouse Style Kitchen Progress Photos and Details- Almost There! 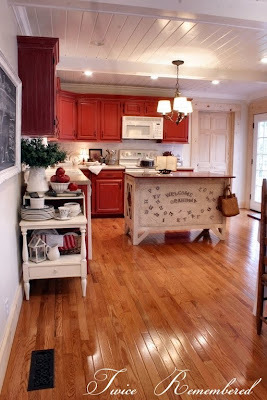 Well, I keep calling it the "RED" cottage kitchen, but I guess it's only the cabinets that are red! But I can tell that red will be running accent color in our cottage, so why not?! In one of my last entries, I mentioned that I had changed my mind about having green walls in the kitchen. For the last couple of years, they have been primed green in expectation of a soft green sagey color. Instead, I decided to go with an even lighter and softer look. I searched high and low for just the right shade of warm, off-white and I think I found it in a shade called "Malted Milk" (eggshell finish) from Valspar paints (at Lowes). I wanted something that would compliment my bisque appliances while also looking great with the pure white trim and ceiling color. The trim and ceiling color is called "Anthem White" (semi-gloss finish), also from Valspar at Lowes. For those of you that may be interested, the cabinet color is called "Cherry" (satin finish)from the Waverly collection at Lowes. Someone emailed me and said that there are lots of "cherry something" paint shades from Waverly, but this one is just plain "Cherry". I'll try to find the paint color code and post it. If you have more questions about the cabinets and finish, you may want to take a look at my FAQ page - and of course, feel free to email me with your questions, too! The lighting is from the House Beautiful collection from Kichler. I ordered the lights online a couple of years ago and unfortunately, I don't remember from which lighting site. I have checked all over to see if I can find this particular style again and I haven't been able to find it - I think it may be discontinued. BUT, you may be able to find it on Ebay...I have found my island light on EBAY for much less than what I paid for it. In fact, here is one on Ebay right now. The undercabinet lights are little puck /disk lights that have been hardwired...we can turn them on and off by a switch. We used Xenon bulbs that have a nice warm glow to them. The faucet is from the Kingston Brass "Restoration Collection" and the cabinet pulls are from the Adagio collection at Berenson Hardware. Thank you, Kelli for donating our cabinet pulls to us! I never mentioned that before because I wasn't sure if she wanted me, too, but I think she deserves a giant public THANK YOU for such a kind and unexpected act! The countertops are laminate (from Lowes). I don't remember the name of this particular pattern, but it has a stone look to it with various shades of tan and brown with a little cream here and there. When we bought our countertops a couple of years ago, it was a standard pattern that they had available to buy right from the store without special ordering. We did have to order ours, though, because we needed a longer piece than what they had available. Something like soapstone would have been WONDERFUL, but we were, and ARE, on a very tight budget. If we ever sold our house, I don't know if we'd get a return on something higher end anyway because we live in a very modest neighborhood home prices are in the $120 - 160 (we live in TN). BUT, if it was ever in the budget, I'd probably go for it anyway! The backsplash was created using brick pavers, also bought at Lowes. I painted them "Anthem White" but then aged and toned them down with a brown translucent glaze (burnt umber, I believe?). The sink is from American standard and is the color bisque. The appliances are all bisque as well. The shelfpaper used inside the cabinets is actually wallpaper. I applied it the same as you would apply wallpaper, but then I applied 2-4 coats of clear polyeurothane for heavy duty protection. It's held up great so far! At some point, I'd like to add sweet little lace trimmings to the edge of the shelves. Wouldn't that be lovely? The flooring that we will be installing is solid oak hardwood from Bruce, in the Marsh finish. It's a color similar to our island top and table top. Our dining table and kitchen island were made by Fuzzot Furniture. They make all their furniture using old house parts. Pretty nifty, huh?! They are out of GA, I believe, and also sell at a few flea markets in the southeastern part of the US. 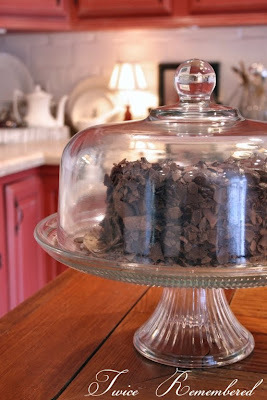 The Twice Remembered sweets and treats under the glass dome were made by yours truly. Yes, someday I'll get my faux candy and treat business off the ground. I have to work a lot in the garage to make these sweets and I'm finding that this just isn't possible for me during the colder months. Also, I'm finding that when folks buy my candy, they like to buy several boxes at a time, which is GREAT! But my inventory disappears quickly and it's hard for me to stay stocked. I guess a nice problem to have, though! But I'm working on other crafts and items to sell until I can work in the garage again in the spring. Most of the other accessories came from Goodwill, Ebay, or Old Time Pottery. I hardly ever by new, but when I do, I make sure it's not pricey! Speaking of accessories, I'm looking forward to warming up the kitchen with other pieces as time goes by. We still have the flooring to put in, the beadboard (halfway up the wall) and doortrim to install, and after that point, I'll be able to better see what else I want to do. There are a couple of really blank walls that need attention, for sure! A work in progress! I know that after our doortrim is intalled, above the frenchdoors I want to install a long shelf supported by a couple of white wrought iron brackets. That door needs a little more presence, I believe. Well, I hope this has answered a few questions! Let me know if you have more:) I wanted to also mention - and not for the purposes of bragging but for the sake of encouragement, that hubs and I did all the work so far ourselves with the exception of installing the brick pavers. I mention this because if we can do it, anyone can! We knew nothing of home renovation when we moved into our house 4 1/2 years ago and while it takes us forever to complete our projects (through lots of trial and error), it has saved us a ton of money. While it can be frustrating to have projects drag on so long, if that's the only choice you have besides not doing anything at all, then I say go for it! (Ok, that's what I say right now...yesterday I was saying something different, hehe!) But seriously, you can do it, little by little! This is where the whole thing started...with the cabinets! This is hard to see, but it's a stencil relief that I put all the way around the entryways to and from the kitchen and living room. I created it using a large stencil and drywall mud. The pears are fake and are from Wal-mart... .99 each! Feel free to share with me more decorating ideas! Thanks for stopping by! And thanks to all of you who have stopped by my Rate My Space page at HGTV and have given me a few stars... I appreciate that so much! If you enjoyed this do-it-yourself project, be sure to check out the DIY party going on at Kimba's Soft Place to Land right now - LOTS of great completed projects to peruse! Just click on the button below! WOW, Kim! I haven't been by in awhile & Angela at Cottage Magpie gave us a heads up on what else you have been doing to your kitchen. I loved the green walls & had seen everything up to installing the light fixtures, but WOW, oh WOW, how great it all looks. 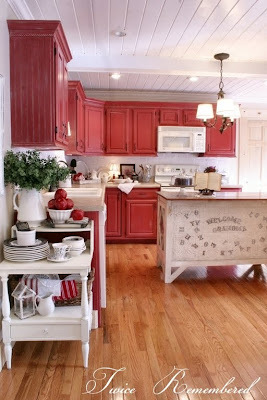 I do think the softer cream paint really looks terrific with the red cabinets. And those light fixtures just MAKE the room. I'm in the market for a foyer & Diningroom fixture & am really trying to make the right decisions. Love yours! I have an idea for what I want in the DR, if I can find one for a good price. I'll check out that Kichler line. Y'all should be very proud of all that you have accomplished. I know how much hard work goes into a kitchen renovation & it is SO hard to get it all done. But, well worth the effort. Big congrats! It's truly magazine worthy. P.S. I used Anthem White for my trim too. It was already painted white when we got here & that shade matched up perfectly when I went back to get more. Are you planning on removing your cabinets when you replace the subfloor, or are you going to leave the existing subfloor under the cabinets and just replace everything else? We are contemplating a similar project and aren't sure how to do it yet. Wow! It looks fantastic! You guys did such a great job with everything! I particularly like the ceiling - was that difficult to do? 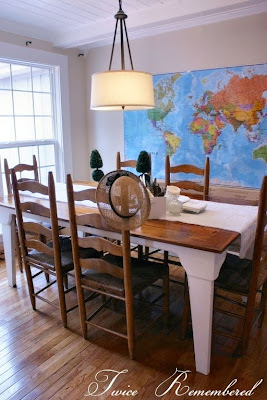 I need a way to cover up a stippled ceiling in my family room and I had thought of doing this too. I have been anxiously awaiting pictures of your lovely redo since my fellow blogger Bound4Kentucky sent me your link. Thanks so much for sharing all of the amazing photographs as well as the details.Your and your husbands insight is just beyond words!! I love the it all from those wonderful ceilings down to flooring. I am headed over to now to give you kudos on the site you listed!!!! Kim your new kitchen looks GREAT!! Good job! It is spectacular. How inspiring for all of us working on a tight budget! You have shown us that we really CAN do it! Wow!! It's all beautiful! You did a wonderful job. I love the red cabinets. I love the ceiling. I would like to do my kitchen ceiling like that. It looks so great! Your ceiling is genius. I love how the whole room is cottagey and yet clean and modern at the same time. You are an inspiration for sure. I'd love to stay on your list of sites too. 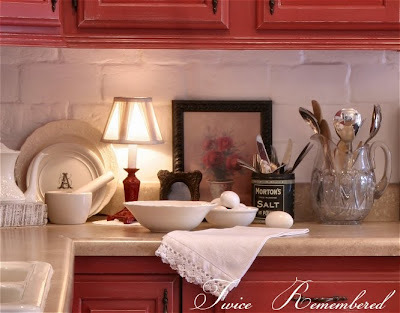 The red cabinets are lovely. I painted mine red about 3 yrs ago and have enjoyed every single minute of them! They have really stayed looking good, too. What else can I say! I have loved following the process in your home remodel! You should be SOOOO proud and happy... and relieved it is finally done!!! Thanks for sharing with us... and inspiring us! LOVE your sweet treats! I would have never known they were not real! WOW! You have me inspired again. Thank You! I can't do much with my kitchen at this point in time, due to renting, but what I CAN do has just been lit again. YIPPEE!!! Marking you for my bloglines so I can keep up with your cottage adventure! I just got the link from Beck. All I can say is WOW!!!! We are getting ready to start some things in our house and you have given me some inspiration. I think I posted once before several weeks ago but I STILL just LOVE your ceiling and how it turned out. It all looks wonderful. We're getting ready to sell our home yet I am still tempted to do that to the kitchen/dining ceilings! Oh my goodness...your home is so unbelievably beautiful...!!! I love everything about your kitchen, especially the beautiful shelf liners (in a dish print)...that is something I just might have to do, even if I'm the only one to see it!! Thanks for sharing your pictures,What a great redo!It's amazing! Kim, that is just wonderful. I particularly like the little vignette with the coffeepot and sweets. I love your island, and your ceilings look just like I envision mine! Someday! The difference is just amazing. I love your photos! It has been so long since I dropped by and I just love what you have done. It's just gorgeous and you should be so pleased with yourself for all your hard work. It's really inspiring! I love your 'after' shots. It looks so good. Well done on all your work, it really looks very homely. Your kitchen looks just wonderful. You and your dh have done a beautiful job on everything. 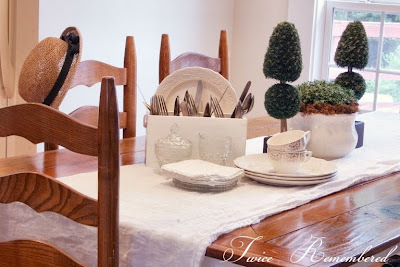 You certainly have a way with creating delightful little vignettes to make it even more cottagey . Thank you, ladies, for all your generous comments! They've really made my month! Jennifer, we are just going to leave the existing subfloor under the cabinets. In fact, much of the subflooring near the cabinets is ok - but we've got some old rot damage near the doors, plus we'll have to remove the subflooring near the "hump" in the middle of floor where the addition was put added by the previous owners. So most of the subflooring will be replaced, but not all. I love, love, love the ceiling. It draws the eye upward so much! I may have to steal your idea, as our kitchen ceiling is pretty sad-looking after years of cooking. 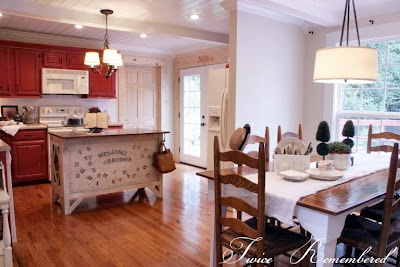 My kitchen is yours in reverse - red walls and creamy white cabinets! I just went with Navajo White, though, and wish I would have looked longer. Did you paint each tongue and groove panel individually, or did you paint them while they were up on the ceiling? Fabulous kitchen redo. 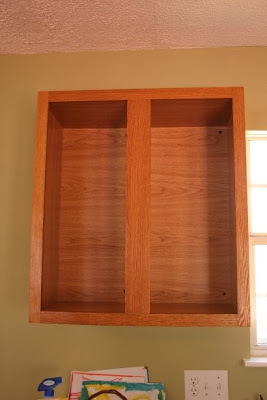 We just bought a house and I plan on doing the same thing, painting the oak cabinets a creamy white, walls a wheat yellow. And trying my best to create a cottage look that fits me. I am so not good with that sort of thing. Love all the photos. Oh my gosh! I am in LOVE with your updates!!!! How insanely BEAUTIFUL! a wonderful flair for decorating! I am so tickled with the changes you've made in your kitchen and the ceiling is just beautiful. I look forward to seeing more. Your blog is adorable! Love, love, LOVE your red cabs! Esp. with the insides done. WOW. 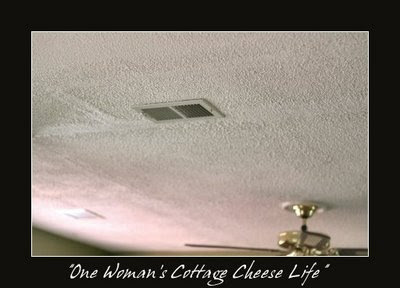 Cottage cheese ceilings, lol! The new ceilings are fab. I LOVE your kitchen! I just bought the stone subway-esque tiles to redo my backsplash today. I noticed somewhere in your blog that you used colored brick in your backsplash. Now it looks like it's white. Did you change your mind or did the brick backsplash come later??? Another question: How did you border the backsplash? I was thinking about just bordering it (where it meets the wall) by placing the tiles vertically, but I haven't found many pictures to help with that decision. What did you do? Thanks so much for sharing your remodeling secrets and bargains. I love that! We just laid our countertop using granite tiles from a place called floor decor-$600 vs. more than $2000 if we would have had it installed from a place like Home Depot! Thanks again for posting all of your beautiful pictures and excellent advice! Wow, I am so glad I stumbled apon your website. I have been struggling with what I want to do in my outdated dark kitchen, and this is exactly what I was looking for! I just love, love, love the ceiling! You are a genius for thinking of putting those boards up to cover up the cottage cheese! If you have any more pics, and tips and tricks for how you did that I would love to hear them!! Just beautiful!! I painted my kitchen cabinets red too and I love them. Where did you get those amazing moldings on your cabinets?! I'm totally inspired!!! we're thinking of buying an old farmnhouse (c. 1870) and I was looking for ideas on the Web-- you have a really nice touch on all the little details of your house that lend authenticity (even tho some of them are from Walmart!) and make the house a home. =D Thanks for sharing your ideas-- it's beautiful! Oh, my goodness that is absolutely fabulous. It looks like it just stepped out of the pages of a magazine! Thank you for sharing so many links. This is amazing! WOW WOW WOW WOW WOW!!!!!!! Amazing makeover! I really love it all, but what I can't get over is how much I love that ceiling! It's just gorgeous! I'm fascinated by the choice of pavers for the backsplash. Were they cheaper than standard tile? Were they very thick? You said you got help installing those. Did they install them just like you would tile with mortar? Very inspiring! Thanks for sharing all of your experience! I just love it so so much! Honestly one of my very favorite kitchens on the web. Ohhhh I love this soo sooo much! 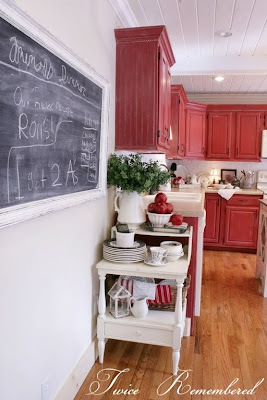 I love love love those red cabinets! Your kitchen is absolutely gorgeous! It's so bright and pretty! What a beautiful makeover; thank you for including so many pictures and so much information about everything. Love that light over your island, and how cool to have been gifted the cabinet hardware!! 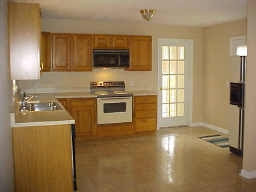 I especially appreciate seeing the pic of what you have on top of your fridge -- I took out the over-fridge cabinet in our kitchen but am now not sure what to put on top of the fridge to make that little area not look so bare -- your pic has given me a few ideas. We are in the process of making over our kitchen ourselves too(fortunately, my hubby is pretty handy and I'm game to try anything that is DIY). I agree with you that it can take longer to DIY, but it feels pretty wonderful to see what we've done thus far and know we've done it ourselves, and to know how much money we've saved by doing it ourselves. It's very inspirational to see what y'all have done. Simply gorgeous!! You all are so kind! Thank you for visiting and for your thoughtful comments! Wow, what a stunning kitchen! I love the wall stencil. How creative! Pitch perfect! I'd love to hear more about the ceiling. I LOVE your home! It is so warm and inviting...perfect! I also appreciate your tips and information! Your work is very inspirational.I've always wanted to change things in my kitchen and you've made it seem "do-able". Thank you! Wow! 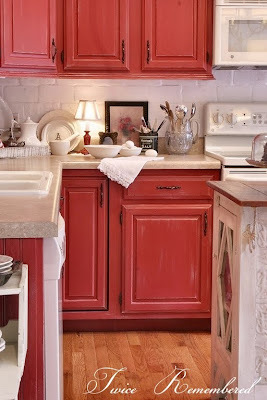 I never would have thought about RED cabinets. This is fabulous! Everything looks great!!!! Simply stunning--would you consider giving a tutorial on the paver backsplash? It looks ultra cool cottage!! Thanks!! Your kitchen is beautiful! The ceiling especially caught my attention since I have a cottage cheese ceiling with *ahem* sparkles, and it needs to go. Your amazing ceiling has inspired me! I'm wondering--did you scrape down the texture before you put the new ceiling up, or just put it up right over the top of the old one? Holy Cow! How beautiful is your kitchen!! I'm sooo jealous! You and your husband have done a wonderful job. It's nice to see someone else doing a remodel slowly. My husband and I have been working on ours for about 4 years and it takes awhile for a project to be completely done. My kitchen is last though. :( Probably right before we sell it! Seriously, WOW! 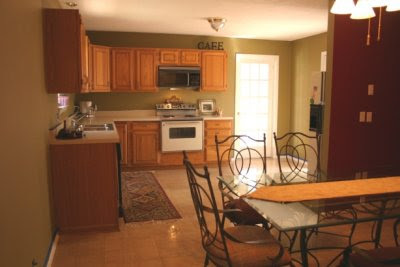 I've seen photos of your kitchen before, but they are sooooo worth seeing again. So awesome it, and you, should be featured in a magazine, it's THAT GOOD! This REALLY is a wonderfull kitchen! My favorite so far... Must be the red cabinets. I totaly love it. The ceillings are gorgeous too... Really, really nice work! I think I love you...smile..Your kitchen just makes me want to smile. I could do dishes all day in a kitchen like yours...Beautiful!! You sure do know how to make my day! Thanks, ladies! I am so, so, soooo proud of your cabinet makeover! Since I do this for a living, it just gets me all excited when I see people try it themselves!!!!!! I love seeing the oak color go bye-bye!!! Terrifc job! amazing kitchen! I love how you did so many special touches to make it original. Wonderful job. You are truly a clever, clever girl!